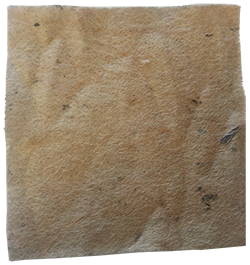 These Grow Mats are made from a natural organic fiber mat made without use of toxic binders or chemical additives. They are thin (1/8 inch) 10"x10" pads. Pack of 12. * Cuts easily to size to fit any application! Cut and use as a medium for sprouting seeds for planting, or growing edible sprouts! These liners hold moisture for extra insurance that your sprouts will survive and thrive. Commercial sprouting companies report a longer shelf life for sprouts grown using Gro Mat Tray Liners. Makes an excellent liner for hanging baskets! Purchase our pre-cut liners or cut to your own dimensions. Use the Grow Mat to line plant pots, to cover soil in pots, and significantly reduce need for watering due to evaporation. When transplanting into pots, fill the pot 1/3 with soil then, cut a square of Grow Mat and place on top of soil. Put the balance of soil and plants into pot. This will reduce your water usage dramatically! Do not try to re-use your Grow Mat. Just compost your used pad and start fresh with your next crop.